Is there anything Tom Brady doesn’t do well? 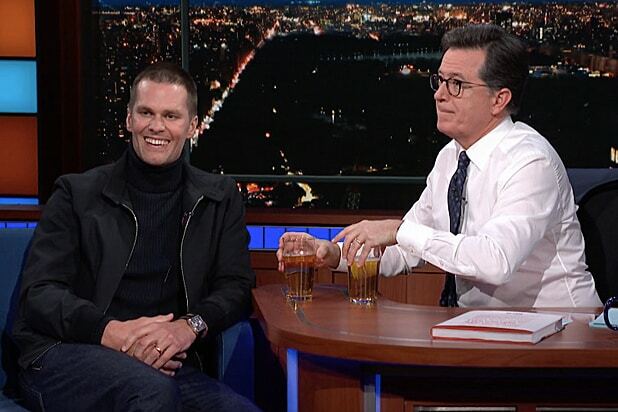 Brady ditched the avocado ice cream and performance meals to down a cold one with Stephen Colbert on Monday. The 40-year-old New England Patriots quarterback dropped by the “Late Show” to chat about the final episode of his Facebook Watch series “Tom vs. Time,” but somehow got cajoled into downing a beer with the CBS late-night host. When asked about his infamously strict TB12 Method nutrition plan, Brady said he “rarely” drinks beer. That answer of course prompted Colbert to place a pair of pints on the table. “I was a pretty good beer chugger back in the day,” Brady said. “I don’t know if you’re a competitive guy,” Colbert pondered. There’s five Super Bowl rings that prove that he is. Spoiler alert: Brady nailed it. Watch the video below — and think twice before you challenge Tom to compete in anything.